49:0.1 ALL MORTAL-INHABITED worlds are evolutionary in origin and nature. These spheres are the spawning ground, the evolutionary cradle, of the mortal races of time and space. Each unit of the ascendant life is a veritable training school for the stage of existence just ahead, and this is true of every stage of man’s progressive Paradise ascent; just as true of the initial mortal experience on an evolutionary planet as of the final universe headquarters school of the Melchizedeks, a school which is not attended by ascending mortals until just before their translation to the regime of the superuniverse and the attainment of first-stage spirit existence. 49:1.4Evolution is the rule of human development, but the process itself varies greatly on different worlds. Life is sometimes initiated in one center, sometimes in three, as it was on Urantia. On the atmospheric worlds it usually has a marine origin, but not always; much depends on the physical status of a planet. Life Carriers have great latitude in their function of life initiation. 49:2.9 The Satania system contains all of these types and numerous intermediate groups, although some are very sparingly represented. 49:2.10 1. The atmospheric types. The physical differences of the worlds of mortal habitation are chiefly determined by the nature of the atmosphere; other influences which contribute to the planetary differentiation of life are relatively minor. 49:2.11 The present atmospheric status of Urantia is almost ideal for the support of the breathing type of man, but the human type can be so modified that it can live on both the superatmospheric and the subatmospheric planets. Such modifications also extend to the animal life, which differs greatly on the various inhabited spheres. There is a very great modification of animal orders on both the sub- and the superatmospheric worlds. 49:2.12 Of the atmospheric types in Satania, about two and one-half per cent are subbreathers, about five per cent superbreathers, and over ninety-one per cent are mid-breathers, altogether accounting for ninety-eight and one-half per cent of the Satania worlds. 49:2.13 Beings such as the Urantia races are classified as mid-breathers; you represent the average or typical breathing order of mortal existence. If intelligent creatures should exist on a planet with an atmosphere similar to that of your near neighbor, Venus, they would belong to the superbreather group, while those inhabiting a planet with an atmosphere as thin as that of your outer neighbor, Mars, would be denominated subbreathers. 49:2.14 If mortals should inhabit a planet devoid of air, like your moon, they would belong to the separate order of nonbreathers. This type represents a radical or extreme adjustment to the planetary environment and is separately considered. Nonbreathers account for the remaining one and one-half per cent of Satania worlds. 49:2.15 2. The elemental types. These differentiations have to do with the relation of mortals to water, air, and land, and there are four distinct species of intelligent life as they are related to these habitats. The Urantia races are of the land order. 49:2.16 It is quite impossible for you to envisage the environment which prevails during the early ages of some worlds. These unusual conditions make it necessary for the evolving animal life to remain in its marine nursery habitat for longer periods than on those planets which very early provide a hospitable land-and-atmosphere environment. Conversely, on some worlds of the superbreathers, when the planet is not too large, it is sometimes expedient to provide for a mortal type which can readily negotiate atmospheric passage. These air navigators sometimes intervene between the water and land groups, and they always live in a measure upon the ground, eventually evolving into land dwellers. But on some worlds, for ages they continue to fly even after they have become land-type beings. 49:2.17 It is both amazing and amusing to observe the early civilization of a primitive race of human beings taking shape, in one case, in the air and treetops and, in another, midst the shallow waters of sheltered tropic basins, as well as on the bottom, sides, and shores of these marine gardens of the dawn races of such extraordinary spheres. Even on Urantia there was a long age during which primitive man preserved himself and advanced his primitive civilization by living for the most part in the treetops as did his earlier arboreal ancestors. And on Urantia you still have a group of diminutive mammals (the bat family) that are air navigators, and your seals and whales, of marine habitat, are also of the mammalian order. 49:2.18 In Satania, of the elemental types, seven per cent are water, ten per cent air, seventy per cent land, and thirteen per cent combined land-and-air types. But these modifications of early intelligent creatures are neither human fishes nor human birds. They are of the human and prehuman types, neither superfishes nor glorified birds but distinctly mortal. 49:2.19 3. The gravity types. By modification of creative design, intelligent beings are so constructed that they can freely function on spheres both smaller and larger than Urantia, thus being, in measure, accommodated to the gravity of those planets which are not of ideal size and density. 49:2.20 The various planetary types of mortals vary in height, the average in Nebadon being a trifle under seven feet. Some of the larger worlds are peopled with beings who are only about two and one-half feet in height. Mortal stature ranges from here on up through the average heights on the average-sized planets to around ten feet on the smaller inhabited spheres. In Satania there is only one race under four feet in height. Twenty per cent of the Satania inhabited worlds are peopled with mortals of the modified gravity types occupying the larger and the smaller planets. 49:2.21 4. The temperature types. It is possible to create living beings who can withstand temperatures both much higher and much lower than the life range of the Urantia races. There are five distinct orders of beings as they are classified with reference to heat-regulating mechanisms. In this scale the Urantia races are number three. Thirty per cent of Satania worlds are peopled with races of modified temperature types. Twelve per cent belong to the higher temperature ranges, eighteen per cent to the lower, as compared with Urantians, who function in the mid-temperature group. 49:2.22 5. The electric types. The electric, magnetic, and electronic behavior of the worlds varies greatly. There are ten designs of mortal life variously fashioned to withstand the differential energy of the spheres. These ten varieties also react in slightly different ways to the chemical rays of ordinary sunlight. But these slight physical variations in no way affect the intellectual or the spiritual life. 49:2.23 Of the electric groupings of mortal life, almost twenty-three per cent belong to class number four, the Urantia type of existence. These types are distributed as follows: number 1, one per cent; number 2, two per cent; number 3, five per cent; number 4, twenty-three per cent; number 5, twenty-seven per cent; number 6, twenty-four per cent; number 7, eight per cent; number 8, five per cent; number 9, three per cent; number 10, two per cent—in whole percentages. 49:2.24 6. The energizing types. Not all worlds are alike in the manner of taking in energy. Not all inhabited worlds have an atmospheric ocean suited to respiratory exchange of gases, such as is present on Urantia. During the earlier and the later stages of many planets, beings of your present order could not exist; and when the respiratory factors of a planet are very high or very low, but when all other prerequisites to intelligent life are adequate, the Life Carriers often establish on such worlds a modified form of mortal existence, beings who are competent to effect their life-process exchanges directly by means of light-energy and the firsthand power transmutations of the Master Physical Controllers. 49:2.25 There are six differing types of animal and mortal nutrition: The subbreathers employ the first type of nutrition, the marine dwellers the second, the mid-breathers the third, as on Urantia. The superbreathers employ the fourth type of energy intake, while the nonbreathers utilize the fifth order of nutrition and energy. The sixth technique of energizing is limited to the midway creatures. 49:2.26 7. The unnamed types. There are numerous additional physical variations in planetary life, but all of these differences are wholly matters of anatomical modification, physiologic differentiation, and electrochemical adjustment. Such distinctions do not concern the intellectual or the spiritual life. 49:4.9 But mortal mind without immortal spirit cannot survive. The mind of man is mortal; only the bestowed spirit is immortal. Survival is dependent on spiritualization by the ministry of the Adjuster—on the birth and evolution of the immortal soul; at least, there must not have developed an antagonism towards the Adjuster’s mission of effecting the spiritual transformation of the material mind. 49:5.9 The inhabited spheres of the seven superuniverses are peopled with mortals who simultaneously classify in some one or more categories of each of these seven generalized classes of evolutionary creature life. But even these general classifications make no provision for such beings as midsoniters nor for certain other forms of intelligent life. The inhabited worlds, as they have been presented in these narratives, are peopled with evolutionary mortal creatures, but there are other life forms. 49:5.10 1. Adjustment to planetary environment. There are three general groups of inhabited worlds from the standpoint of the adjustment of creature life to the planetary environment: the normal adjustment group, the radical adjustment group, and the experimental group. 49:5.11 Normal adjustments to planetary conditions follow the general physical patterns previously considered. The worlds of the nonbreathers typify the radical or extreme adjustment, but other types are also included in this group. 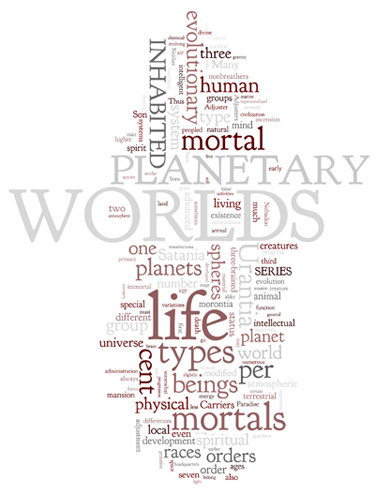 Experimental worlds are usually ideally adapted to the typical life forms, and on these decimal planets the Life Carriers attempt to produce beneficial variations in the standard life designs. Since your world is an experimental planet, it differs markedly from its sister spheres in Satania; many forms of life have appeared on Urantia that are not found elsewhere; likewise are many common species absent from your planet. 49:5.12 In the universe of Nebadon, all the life-modification worlds are serially linked together and constitute a special domain of universe affairs which is given attention by designated administrators; and all of these experimental worlds are periodically inspected by a corps of universe directors whose chief is the veteran finaliter known in Satania as Tabamantia. 49:5.13 2. Brain-type series. The one physical uniformity of mortals is the brain and nervous system; nevertheless, there are three basic organizations of the brain mechanism: the one-, the two-, and the three-brained types. Urantians are of the two-brained type, somewhat more imaginative, adventurous, and philosophical than the one-brained mortals but somewhat less spiritual, ethical, and worshipful than the three-brained orders. These brain differences characterize even the prehuman animal existences. 49:5.14 From the two-hemisphere type of the Urantian cerebral cortex you can, by analogy, grasp something of the one-brained type. The third brain of the three-brained orders is best conceived as an evolvement of your lower or rudimentary form of brain, which is developed to the point where it functions chiefly in control of physical activities, leaving the two superior brains free for higher engagements: one for intellectual functions and the other for the spiritual-counterparting activities of the Thought Adjuster. 49:5.15 While the terrestrial attainments of the one-brained races are slightly limited in comparison with the two-brained orders, the older planets of the three-brained group exhibit civilizations that would astound Urantians, and which would somewhat shame yours by comparison. In mechanical development and material civilization, even in intellectual progress, the two-brained mortal worlds are able to equal the three-brained spheres. But in the higher control of mind and development of intellectual and spiritual reciprocation, you are somewhat inferior. 49:5.16 All such comparative estimates concerning the intellectual progress or the spiritual attainments of any world or group of worlds should in fairness recognize planetary age; much, very much, depends on age, the help of the biologic uplifters, and the subsequent missions of the various orders of the divine Sons. 49:5.17 While the three-brained peoples are capable of a slightly higher planetary evolution than either the one- or two-brained orders, all have the same type of life plasm and carry on planetary activities in very similar ways, much as do human beings on Urantia. These three types of mortals are distributed throughout the worlds of the local systems. In the majority of cases planetary conditions had very little to do with the decisions of the Life Carriers to project these varied orders of mortals on the different worlds; it is a prerogative of the Life Carriers thus to plan and execute. 49:5.18 These three orders stand on an equal footing in the ascension career. Each must traverse the same intellectual scale of development, and each must master the same spiritual tests of progression. The system administration and the constellation overcontrol of these different worlds are uniformly free from discrimination; even the regimes of the Planetary Princes are identical. 49:5.19 3. Spirit-reception series. There are three groups of mind design as related to contact with spirit affairs. This classification does not refer to the one-, two-, and three-brained orders of mortals; it refers primarily to gland chemistry, more particularly to the organization of certain glands comparable to the pituitary bodies. The races on some worlds have one gland, on others two, as do Urantians, while on still other spheres the races have three of these unique bodies. The inherent imagination and spiritual receptivity is definitely influenced by this differential chemical endowment. 49:5.20 Of the spirit-reception types, sixty-five per cent are of the second group, like the Urantia races. Twelve per cent are of the first type, naturally less receptive, while twenty-three per cent are more spiritually inclined during terrestrial life. But such distinctions do not survive natural death; all of these racial differences pertain only to the life in the flesh. 49:5.21 4. Planetary-mortal epochs. This classification recognizes the succession of temporal dispensations as they affect man’s terrestrial status and his reception of celestial ministry. 49:5.22 Life is initiated on the planets by the Life Carriers, who watch over its development until sometime after the evolutionary appearance of mortal man. Before the Life Carriers leave a planet, they duly install a Planetary Prince as ruler of the realm. With this ruler there arrives a full quota of subordinate auxiliaries and ministering helpers, and the first adjudication of the living and the dead is simultaneous with his arrival. 49:5.23 With the emergence of human groupings, this Planetary Prince arrives to inaugurate human civilization and to focalize human society. Your world of confusion is no criterion of the early days of the reign of the Planetary Princes, for it was near the beginning of such an administration on Urantia that your Planetary Prince, Caligastia, cast his lot with the rebellion of the System Sovereign, Lucifer. Your planet has pursued a stormy course ever since. 49:5.24 On a normal evolutionary world, racial progress attains its natural biologic peak during the regime of the Planetary Prince, and shortly thereafter the System Sovereign dispatches a Material Son and Daughter to that planet. These imported beings are of service as biologic uplifters; their default on Urantia further complicated your planetary history. 49:5.25 When the intellectual and ethical progress of a human race has reached the limits of evolutionary development, there comes an Avonal Son of Paradise on a magisterial mission; and later on, when the spiritual status of such a world is nearing its limit of natural attainment, the planet is visited by a Paradise bestowal Son. The chief mission of a bestowal Son is to establish the planetary status, release the Spirit of Truth for planetary function, and thus effect the universal coming of the Thought Adjusters. 49:5.26 Here, again, Urantia deviates: There has never been a magisterial mission on your world, neither was your bestowal Son of the Avonal order; your planet enjoyed the signal honor of becoming the mortal home planet of the Sovereign Son, Michael of Nebadon. 49:5.27 As a result of the ministry of all the successive orders of divine sonship, the inhabited worlds and their advancing races begin to approach the apex of planetary evolution. Such worlds now become ripe for the culminating mission, the arrival of the Trinity Teacher Sons. This epoch of the Teacher Sons is the vestibule to the final planetary age—evolutionary utopia—the age of light and life. 49:5.28 This classification of human beings will receive particular attention in a succeeding paper. 49:5.29 5. Creature-kinship serials.Planets are not only organized vertically into systems, constellations, and so on, but the universe administration also provides for horizontal groupings according to type, series, and other relationships. This lateral administration of the universe pertains more particularly to the co-ordination of activities of a kindred nature which have been independently fostered on different spheres. These related classes of universe creatures are periodically inspected by certain composite corps of high personalities presided over by long-experienced finaliters. 49:5.30 These kinship factors are manifest on all levels, for kinship serials exist among nonhuman personalities as well as among mortal creatures—even between human and superhuman orders. Intelligent beings are vertically related in twelve great groups of seven major divisions each. The co-ordination of these uniquely related groups of living beings is probably effected by some not fully comprehended technique of the Supreme Being. 49:5.31 6. Adjuster-fusion series. The spiritual classification or grouping of all mortals during their prefusion experience is wholly determined by the relation of the personality status to the indwelling Mystery Monitor. Almost ninety per cent of the inhabited worlds of Nebadon are peopled with Adjuster-fusion mortals in contrast with a near-by universe where scarcely more than one half of the worlds harbor beings who are Adjuster-indwelt candidates for eternal fusion. 49:5.32 7. Techniques of terrestrial escape. There is fundamentally only one way in which individual human life can be initiated on the inhabited worlds, and that is through creature procreation and natural birth; but there are numerous techniques whereby man escapes his terrestrial status and gains access to the inward moving stream of Paradise ascenders. 49:6.2 From time to time, on motion of the planetary authorities or the system rulers, special resurrections of the sleeping survivors are conducted. Such resurrections occur at least every millennium of planetary time, when not all but “many of those who sleep in the dust awake.” These special resurrections are the occasion for mobilizing special groups of ascenders for specific service in the local universe plan of mortal ascension. There are both practical reasons and sentimental associations connected with these special resurrections. 49:6.5 The group guardians of assignment to the sleeping survivors always function with the judgment Sons on their world advents. “He shall send his angels, and they shall gather together his elect from the four winds.” With each seraphim of assignment to the repersonalization of a sleeping mortal there functions the returned Adjuster, the same immortal Father fragment that lived in him during the days in the flesh, and thus is identity restored and personality resurrected. During the sleep of their subjects these waiting Adjusters serve on Divinington; they never indwell another mortal mind in this interim.